For events that require a certain Latin flavour, you can't beat the frenetic strumming and percussive playing of Bands for Hire's flamenco guitarists. The atmosphere is at once tense, impressive, dramatic and thrilling – just what your guests need for a night of stimulating conversation and exotic dancing! Hailing from southern Spain, Flamenco encompasses so much more than just a style of guitar playing – it's the singing, the dancing, the clapping and the finger snapping all rolled into one breathtaking display of passion. Here at Bands for Hire, you can find fantastic flamenco duos and flamenco solo guitarists whose frantic fretwork will whisk you away to the land of red-blooded senors and alluring senoritas, where you'll be clapping and snapping along with the best! We only want to give you the best experience possible when you book with us here at Bands for Hire, and for that very reason we seek out the greatest Spanish guitar players on offer. 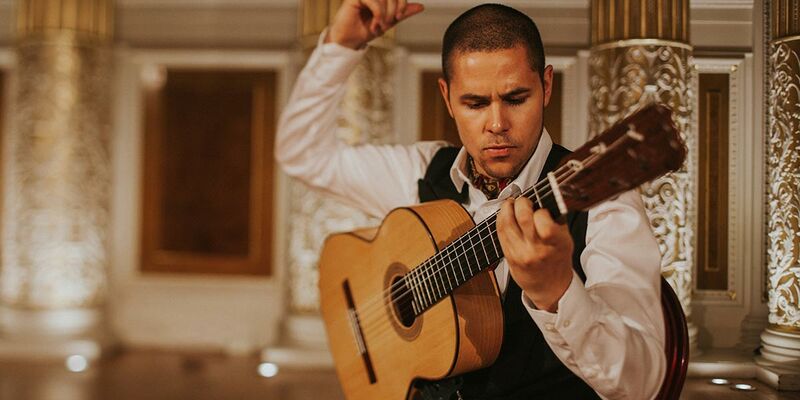 Our Spanish and flamenco guitarists have learned from the best, including the Royal College of Music and renowned master of the form Juan Martin, and have since gone on to perform at various private functions up and down the UK, including events for Volkswagen, Premier League and DC Media. Our flamenco musicians each have an insightful knowledge of the genre that inspires and drives them, and can each boast an extensive repertoire that includes the work of such flamenco icons as Rodrigo Y Gabriela, Tarrega, Torroba and Villas Lobos, as well as a whole host of traditional compositions demonstrating such distinctive Latin rhythms as the Fandango, the Rumba, the Tango and the Zapadiado. Our accomplished Spanish guitarists and flamenco duos also rework classical and popular music to fit their striking guitar playing style – you may just hear a bit of Led Zeppelin, Jimi Hendrix, David Bowie, Bach and Beethoven thrown in for good measure, but you won't have heard it quite like this before! The great thing about our flamenco guitarists is that they bridge the gap between solo musicians and bands – you reap the benefits of having only one or two fairly portable members and having the option of them playing for you at a lower volume, and you also get the highly danceable rhythms. It's a win-win situation that will appeal to all budget and venue requirements, and will go down a storm at wedding receptions, wedding breakfasts, private dinner functions, cocktail parties, meet-and-greets, family get-togethers, work socials, store openings, summer balls, awards ceremonies and graduations as either background music or as the main event. Read on to find out more about our fabulous flamenco guitarists!